Whether you're an aspiring artist or an experienced designer, CorelDRAW Graphics Suite X6 is your trusted graphic design software solution. With its content-rich environment and professional graphic design, photo-editing and website design software, you have everything you need to express your style and creativity with endless possibilities. Quickly feel at home with built-in help, training videos and professionally designed templates. Then, create with confidence, everything from distinctive logos and signs to custom websites, web graphics, billboards, car wraps, flyers and more! 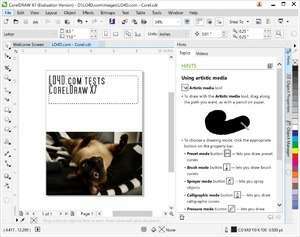 CorelDRAW Suite X6 is a shareware program and can be used as a demo to try the software until the free trial period has ended. A full version of the program is available after the trial period ends. For security reasons, you should also check out the CorelDRAW Suite download at LO4D.com which includes virus and malware tests. Additional screenshots of this application download may be available, too. CorelDRAW Graphics Suite download been highly rated by our users.